Tablets have made their way into industrial warehouse settings. Broken tablets have also made their way into industrial warehouse settings. It’s time for an article on heavy duty tablet mounts. We are going to look at heavy duty tablet mounts with universal cradles. This means they are going to fit mainstream tablets such as the Apple iPad, Apple iPad Air, Samsung Galaxy Note and Samsung Galaxy Tab with or without a case or skin. Many of today’s warehouse management application suites have a mobile option that runs on an Apple iPad. I have even seen stand alone inventory apps. Makes sense. Tablets are very portable and workers can carry them all over the warehouse. They also can be attached to forklifts and warehouse racks. The applications provide inventory counts, product locations and update abilities. If using an expensive tablet in a warehouse, be sure it has a rugged case. It’s a warehouse and will most likely be knocked around. Good quality cases such as the Otterbox Defender or something from the LifeProof lines are typically a safe bet for the best protection. yes, these cases are more expensive than many others, but the added protection they provide are worth the extra cost. It’s a lot cheaper than replacing the tablet. The difference between an industrial heavy duty tablet mount and others is the ability to hang on to your tablet in a rugged environment. Most components need to made of metal to prevent breakage. Mounting a tablet to a forklift is different from mounting it to a car. There is a lot more jarring and vibration. Don’t think a suction cup is going to work. It won’t. Heavy duty tablet mounts are going to clamp more tightly around the tablet to prevent it from falling out. These mounts also need to be easily installed and removed. We will also discuss some mounts that can be bolted onto a flat surface for permanent installations. 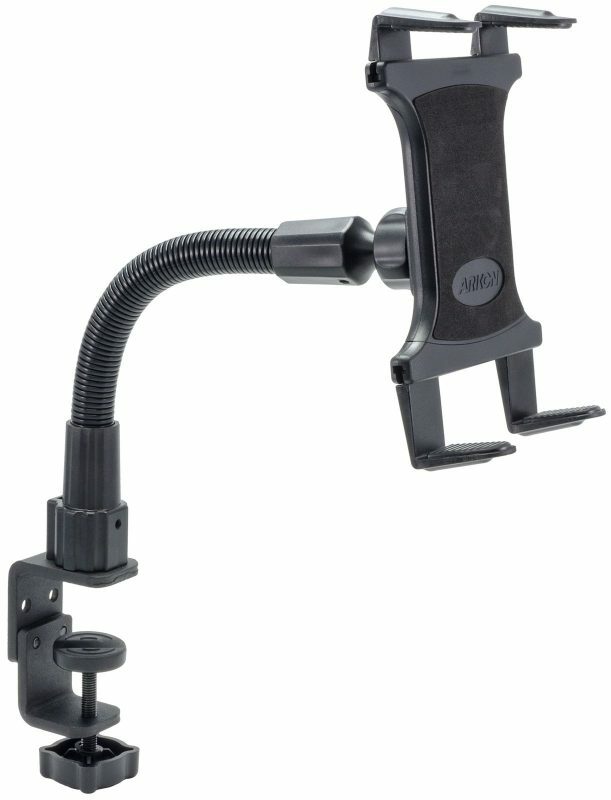 The Arkon Heavy Duty Table Clamp Mount is a good example of a well priced heavy duty mount. The mount includes a 12 inch flexible gooseneck arm that can be bent to almost any angle. The flexible arm is attached to a clamp that opens up to 2.25 inches which is large enough for warehouse racks or a forklift post. The cradle has a set of 8 support legs. You will use four of the legs to hold a tablet. The legs that are used are dependent upon the size of the tablet mounted. The cradle is spring-loaded so it opens to ten inches when using the largest support legs. This means that it fits tablets as small as an iPad Mini and as large as an Apple iPad Pro. The entire mount is made of metal and the cradle is made of heavy duty plastic. The tablet can be rotated into landscape or portrait mode. Consider The Joy Factory Unite Universal Carbon C-Clamp Mount for Tablets which features a cradle that accommodates tablets with 7″ to 11″ displays. It can be swiveled from portrait to landscape mode without removing it from the cradle. This isn’t a spring-loaded cradle. You set the arm length and then tighten with a series of fly wheels. The mount is made of carbon fiber with the cradle being plastic and metal. There are adjustment points at the base and tip of the mount. It has a 2 inch clamp so should fit a wide variety of needs. A similar but even more rugged flat surface for tablets is the RAM X-Grip III Flat Surface Mount . The mount is all metal and the cradle is plastic and metal. The mount itself is manufactured out of marine grade powder coated metal. There is a six-inch arm in the middle and ball and socket at the base and tip so the tablet can be rotated into landscape or portrait mode. The base has a series of pre-drilled holes for mounting onto a flat surface. The manufacturer provides a lifetime warranty. It’s a very well made mounting kit. The cradle that is included in this mount bundle fits tablets such as an Apple iPad Air, Apple iPad 2, Samsung Galaxy Tab S2 9.7 and Samsung Galaxy Note 10.1. These are mid-size and large tablets. The cradle doesn’t fit smaller 7″ tablets but the RAM Flat Surface Mount with Universal X-Grip Holder for 7″ Tablets will fit them fine. This smaller cradle will fit tablets such as the Apple iPad Mini and Samsung Galaxy Tab 7.0. At the heart of these mounts is the X-Grip cradle design which we have liked for a long time. You can read all about X-Grip cradles here. So to summarize our article on the topic of heavy duty tablet mounts. Protect your tablet with a good case. Select a mount that’s made of metal. Attach it somewhere that’s accessible yet won’t be prone to getting knocked around.